I graduated as an actor from the National School of Drama in 1986. Since then, I have worked with Barry John, Amal Allana, Kirti Jain, Anuradha Kapoor Prassanna and many other playwrights and directors. I then joined Theatre in Education, a wing of the NSD, as a teacher. I have taught acting to children as well as adults. I have done a couple of television serials too, but am mainly into theatre. 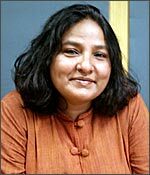 I also worked on the docu-drama Seven Island And A Metro with director Madhushree Dutta. Chak De! India was my first commercial movie. I got the role because of casting director Abhimanyu Ray, who was in search of girls to play those parts. I do regular workshops with students, so he briefed me about the character of the girls. He thought I could fit a role too and asked me to try out. I met Shimit Amin and passed the audition. Strangely, girls from the workshop who came for an audition didn't get selected, but I did! Only one girl from NSD was selected -- Seema Azmi, who played the role of Rani from Jharkhand. After Chak De, my next big commercial films are Sanjya Leela Bhansali's Saawariya and Ghajini with Aamir Khan. 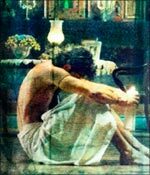 I have seen Sanjay Leela Bhansali's [Images] work since Khamoshi and have liked it a lot. I like his different taste for filmmaking. He makes things larger then life. It is mostly theatrical -- reality as well as fantasy. I got the role in Saawariya through casting director Amita Saighal, who was casting for Saawariya and thought I was suitable for a particular role. Sanjay Leela Bhansali was present at my audition and I got the role which, by the way, isn't very lengthy. I shot a few scenes with Ranbir Kapoor. He is a simple, hardworking boy, but you can't compare him to his father (Rishi Kapoor [Images]). Ranbir is good though, and the best part is he is working with Sanjay Leela Bhansali. I didn't have any scenes with Sonam Kapoor, who also stars in the film, but I had some with Rani Mukerji [Images]. She is a great performer and gets along with everybody. I also got Ghajini because of Amita Saighal. I play the role of a police inspector in this remake of a South Indian movie. It is about a person suffering from short-term memory loss, who is trying to find his girlfriend's killer. Again, my role isn't lengthy, but it is important to the story. I don't have scenes with Aamir Khan, though I have some with both heroines. I have been lucky to work with big names since my first assignment. Shimit is a very decent director, who gives his actors liberty. Shah Rukh would help us in the technical aspects too, like how to face the camera, and from what angle, etc. He was very down to earth and helpful. Before coming into cinema, I had heard about actors and their attitudes. But now, after working with them closely, I understand they are not superstars because they are good actors; they are so because they are good human beings.